Pasadena, CA: Just in time for a warm and blustery Pasadena autumn, Old Town Pasadena welcomes a new neighbor to the beautiful brick-clad historic community. Introducing Sangers & Joe, a vibrant and inviting breakfast, lunch and brunch cafe boasting tasty intercontinental-inspired dishes and beverages opened on Thursday, October 15th, 2015. A concept born through the collaboration of two key players with rich backgrounds in restaurants, Managing Partners Scott Kay (Founder, No Roof Restaurant Group which also includes Wood & Wine and Spin The Bottle Wine Studio) and Dario Dell’ Anno (Wood & Vine, Providence, Mozza Osteria, Drago Centro, Bastide) set out to create Sangers & Joe after stumbling upon an opportunity to take over a space in Old Town Pasadena. Beginning with the design, antique elements stand out in a clean and inviting space draped in white subway tile with a smooth white granite countertop, and community tables with pops of bright orange and blue. Overhead lighting resembling bell-shape sconces, hail from the Philadelphia Civic Center where they shined six stories high above the stage, covered in blue film and a grand metal-plated mirror fixated near the entrance reflects light throughout the interior. As for the menu itself, Consulting Chef Claudio Dell’ Anno (Dell’ Anno’s brother and renowned Michelin starred, Belgium celebrity chef: Le Gavroche (London), De Librije (Holland), Le Calandre (Venice, Italy) and author of the dell’ anno Cookbook, which has sold over 23,000 copies) helped breathe life into the dishes on this opening menu. Chef Claudio has returned to the US after selling his Michelin starred restaurant Ciccio in Belgium. Although the establishment is clearly Aussie by name, the menu at Sangers & Joe is actually a diverse woven tapestry of globally-influenced bites from Europe, Australia and of course, America. There are Breakfast, Lunch and Brunch dishes from scrambles, benedicts and waffles to freshly baked Pastries presented by Cake Monkey Bakery from North Hollywood (and coming to Beverly Blvd. this fall), as well as Hot Panini’s, Sangers (of course) and Salads. The most important meal of the day, Breakfast features an array of clean, tasty and satisfying dishes from Granola & Yogurt with fresh fruit to the hearty and succulent Steak & Eggs plate served with rosemary garlic roasted potatoes. A toasty Smoked SalmonBagel is served with cream cheese, red onions and cornichons and the Crushed Avocado with lime and toast is a delicious way to start the day. Eggs reign in two more signature dishes, including the Joe’s Scramble mixed with fresh kale, onions, herbed tomatoes and burrata and the Breakfast Sanger is topped with scrambled eggs, melted cheese and Applewood bacon. Boasting a morning menu with truly something for everyone, there is a Choose Your Own Adventure menu section as well, offering small bites meant for mixing and matching, like the Two Eggs Any Way, Applewood Bacon, Toast & Jam, a Fruit Cup, Roasted Potatoes and a side of Avocado. For those who are “on the go,” and looking for a quick bite, grab the In & Out Special which includes a pastry, one drip coffee and one fresh juice for under $10.00. For those who prefer muffins, buttery croissants and sweeter treats with their morning cup of Joe, an assortment of delectable Pastries are on display and available daily. These freshly baked bites are procured by the popular North Hollywood baker, Cake Monkey Bakery and include delightful offerings such as Huckleberry Donuts With Maple Glaze, various Muffins, three types of Croissant (Butter, Almond and Sage-Gruyere-Sea-Salt), Brown Sugar Cinnamon Monkey Bread and sweeter treats like the Red Velvet Cake Sandwich, Sticky Toffee Blondie bar and even a Vegan Spicy Chocolate Banana Cookie. On Saturdays and Sundays, breakfast transforms into Brunch, and while most of the weekly morning meals are still available; they are joined by even more hot and delicious offerings. There is the fluffy French Toast with macerated strawberries and syrup, crispy Fried Chicken & Waffles as well as a Waffle with berries and cream and two types of benedicts, including the Eggs Benedict with poached eggs, Parisian ham and spinach atop an English muffin drizzled with Hollandaise sauce and the Smoked Salmon Benedict. Midday to afternoon appetites can be appeased by fresh and seasonal Lunch menu items, featuring Hot Panini’s, Sangers, signature Salads and deli-style Sides. Freshly pressed, warm and toasty, four Hot Panini’s range from classically constructed sandwich flavors like the Caprese with mozzarella, basil, oregano, heirloom tomatoes, lemon and balsamic to a buttery Brie slathered with a tasty fig spread and topped with apples, pine nuts, avocado and micro greens. There is also a Turkey & Cheese Panini pressed with Gouda, fresh turkey, avocado and sautéed kale, as well as a Veggie option loaded with roasted peppers, zucchini, ‘al dente’ kale, a tangy goat cheese spread and green olives. Seven mouth-watering sandwiches, not only literally put the “sanger” in Sangers & Joe, but are also sure to satiate and satisfy. Two tasty “salad sandwich” offerings include the Tuna Salad with snow peas, herb tomatoes and black olives topped with parsley, herbs and lettuces, while the Egg Salad is a fluffy hard-boiled egg chopped mixture of green onion, parsley, mustard, arugula and aioli. The Parisian Ham & Gouda Cheese sanger is served with Dijon mustard and pickled veggies, there is a Turkey Club with bacon, tomato, baby lettuce and aioli and the Prosciutto is a tasty combination of mozzarella, heirloom tomatoes, basil and balsamic. Additionally, there is a Chicken Caesar option with grilled chicken, parmesan, avocado, croutons, lightly sautéed kale and romaine lettuce, as well as the BLTA Sandwich topped with bacon, avocado, tomato and baby lettuce. Leafy green Salads are a standout at Sangers & Joe. These tossed green gems are elevated in clean flavor and components, boasting farm-fresh, seasonal ingredients along with house-made dressings (Chili Ginger and Soy Lime to Lemon Vinaigrette to name a few). Starting with simple and clean, there is an Italian Mozzarella and Tomato Salad with arugula and crostini. There are two classics, including the California Cobb Salad w/ Chicken and the Caesar Salad w/ Avocado and Kale. There are two eponymous signature salads to enjoy as well! The ‘Sangers Salad’ is tossed with mixed greens, avocado, tomato, cucumber, bell pepper, olives, red onion, feta, dates, mixed nuts and an herb dressing while Joe’s Summer Salad comes with burrata, beets, grapefruit, fennel, crunchy greens, parmesan, giant garlic croutons and a lemon-grapefruit dressing. Additionally, there is a succulent Sweet Chili Steak Salad with cucumbers, papaya, fresh peppers, snap peas, soya beans, basil, mint, arugula, mixed greens and a chili ginger dressing. Patrons will also be happy to know that Add-Ons of Bacon, Mary’s Chicken, Steak and Smoked Salmon are available to be added to any salad. Small bites come in the form of deli-style Sides like Red Quinoa/Cucumbers, Fingerling Potato Salad and Spiced Wedge Potatoes to name a few that are perfect for midday snacking. Beverage options are numerous, from creamy coffee creations and Aussie-inspired Joes to hot Tea, fresh Juices, Bottled Drinks and an eclectic array of Beer and Wine options procured by Spin The Bottle Wine Studio in Toluca Lake. While the java menu is well-rounded with drip Coffee, Espresso, Latte, Cappuccino and Cold Brew options, it is hot brewed cups like the Flat White, a coffee prepared by pouring fine bubbled micro-foam over a single shot of espresso, that rule the list. There is the Long Black mixture of a double shot of espresso poured into a large mug and topped off with hot water, the Piccolo Latte, which is a ristretto shot served in a glass demitasse and topped off with milk, as well as the Babycchino with steamed milk and a sprinkling of chocolate or cinnamon for young Joe imbibers. Additionally there is a decadent Belgian Mocha (representing the Dell’ Anno brothers culture of course) that is made with Arabica coffee and European style cocoa. Tea selections are available in Earl Grey, Jasmine Pearls Green Tea, Moroccan Mint and there is also a Chai Tea Latte, to name a few. Three freshly squeezed Juices are available, including Orange, Grapefruit and Mint-Lemonade and an extensive list of Bottled Drinks occupies a portion of the menu. There are classic glass bottles of naturally flavored handcrafted sodas from Boylan’s Orange Soda and Diet Root Beer to Bubble Up, Fentiman’s Cola, Capone Ginger Beer, Virgil’s Cream Soda and Steward’s Grape Soda. Additionally there are San Pellegrino flavored cans of Blood Orange, Limonata and Aranciata, along with Blue Monkey Coconut Water and a pear flavored Kombucha. Wine and Beer selections at Sangers & Joe are eclectic, yet approachable. 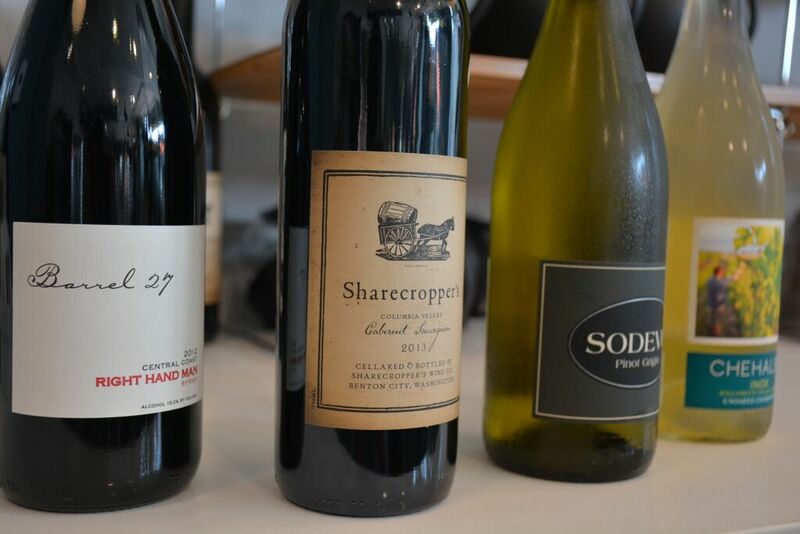 Offering a list curated by Spin The Bottle Wine Studio, varietals vary from the Italian Sodevo Pinot Grigio and Chehalem Chardonnay (Oregon) to the Barrel 27 “Right Hand Man” Syrah (Central Coast, California) and the Sharecropper Cabernet Sauvignon from Columbia Valley. Bottled Beer choices hail from local-domestic and foreign breweries, including California options like Mission IPA (San Diego) and North Coast Scrimshaw Pilsner (Mendocino County) to Kay’s favorite beer from “down under,” brewed in his hometown of Adelaide, Australia, Cooper’s Sparkling Ale. “When it comes down to it, it is not just about opening a cafe,” says Kay. “The inspiration stems more from partnering and connecting with the community.” And that mantra is just what Sangers & Joe is all about: an approachable neighborhood café for breakfast, lunch and brunch (and dinner… stay tuned!) that offers something for everyone in a warm and welcoming environment. Sangers & Joe is open every Monday through Friday from 7:30 am to 4:30 pm, every Saturday from 8:30 am to 5:30 pm and every Sunday from 8:30 am to 4:30 pm. For more information, please visit www.sangersandjoe.com or call Sangers & Joe directly at 323.553.0563.